Man is a product of the earth's surface. This means not merely that he is a child of the earth, dust of her dust; but that the earth has mothered him, fed him, set him tasks, directed his thoughts, confronted him with difficulties that have strengthened his body and sharpened his wits, given him his problems of navigation or irrigation, and at the same time whispered hints for their solution. The opening passage of Ellen Churchill Semple’s influential and pivotal work, Influences of Geographic Environment, expresses the basis of Semple’s theory of environmental determinism, which would help shape the fields of geography, anthropology, sociology, and history for half a century. Semple was born on January 8, 1863, in Louisville, Kentucky, into an affluent family, which included Semple’s four older sisters. One of them, Patty, graduated from Vassar when Ellen was in high school. Patty's description of the rigorous and comprehensive course of study offered at Vassar greatly appealed to the insatiably curious Semple, and upon graduating from private school in Louisville, Ellen enrolled in Vassar at the age of sixteen. Graduating from Vassar in 1882 at the age of 19, she was the youngest member of her graduating class. Because her undergraduate work incorporated anthropology, geography, and economics, at her graduation it was unclear what her degree would be called. Eventually, Semple and the college agreed on a degree in history. The title of her commencement oration “The Conscience of Science” “may be taken," according to Ruth Baugh, "as an indication of the trend in her thinking and her scholarly interests at this time." Semple was class valedictorian and was retroactively made a member of Phi Beta Kappa when the Vassar Mu Chapter was instituted in 1898. After her graduation, Ellen Semple returned to Louisville where she taught geography at a private school owned by one of her older sisters and began her career in cultural geography by conducting the preliminary fieldwork that would lead to her extremely influential article “The Anglo-Saxons of the Kentucky Mountains.” During this time Semple began to develop the theoretical construct that would eventually be called environmental determinism—the idea that a population’s culture is determined by the environment in which they live. In 1891 Semple was granted an external M.A. in sociology for the research she conducted while living in Louisville. Between l891 and 1895 Semple studied in Germany, at the University of Leipzig under the influential professor and anthropogeographer Friedrich Ratzel. Semple was the only woman student among 500 men and was the first woman to be admitted to the seminars in economics and geography. However, because she was a woman, she was not allowed to receive a Ph.D. for the work she conducted at Leipzig. While at Vassar, Semple started a lifelong friendship with fellow classmate Stematz Yamakawa, who was the first Japanese woman to receive a college degree. Upon returning to Japan, Yamakawa married Prince Iwao Oyama, who was the Japanese Minister of War. The new Princess Oyama used her status and power to grant Semple access to Japan’s people and history, making Semple one of the first westerners to study Japanese agriculture and society. She wrote of her findings in the article “Influences of Geographical Conditions Upon Japanese Agriculture,” which was published in 1912. 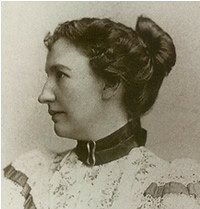 Semple’s first book, American History and Its Geographic Condition, published in 1903, very quickly brought Semple and her theories national recognition. The book gives a scientific basis for the ways in which the movement of the pioneers, and their subsequent settlement, formed the basis of American culture and of its idiosyncrasies. IConsidered a modern classic, the book was used in high school and college teaching by both historians and geographers and was the model on which American history was taught until the 1950s. From Semple's American History and Its Geographic Conditions(1903). 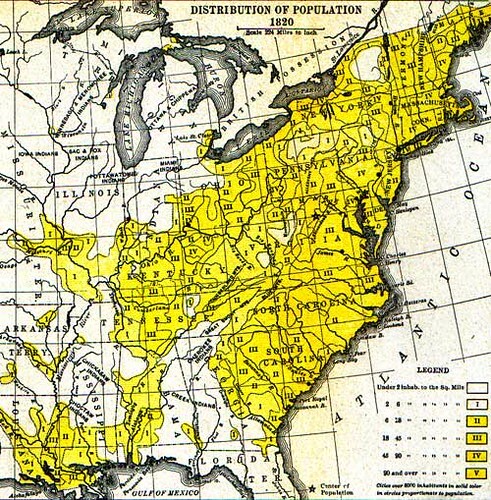 The map shows the influence on westward population movements of rivers, lakes, national roads, swamps, Native American land and fertile soil areas. In 1906 Semple began her professorship at the University of Chicago, which had launched the country’s first department of geography only three years prior in 1903. At Chicago, Semple was renowned for her superb teaching ability. She emphasized the importance of fieldwork and original research and often invited her students to participate in her own research and to engage in original fieldwork of their own. Her second book, Influences of Geographic Environment, published in 1911, proved to be more influential than the first. It was here that Semple made the daring declaration that “man is a product of the earth’s surface.” The theory that climate and environment are the main causes of a person’s behavior—and therefore of the cultures that arise from human behavior and interaction—was an extremely controversial notion, and it launched Semple into international notoriety. From Influences of Geographic Environment on the Basis of Ratzel’s System of Anthropogeography. Distribution Of Religions In The Old World (World map showing distribution of Christians, Mohammedans, Brahmans, Buddhists, and Heathen). In 1914 she was awarded the Cullum Geographical Medal by the American Geographical Society "in recognition of her distinguished contributions to the science of anthropogeography." But, her theory was sometimes used for more nefarious purposes. The Nazi party, for example, cited Semple’s theory of environmental determinism as evidence for the inferiority of the Jewish race, saying that her theory proved that certain people and societies are more civilized and better than others. This, of course, was not the belief of Semple, who emphasized the idea of cultural diversity arising from environmental diversity, but never in a hierarchical manner. In 1921 Semple began teaching at Clark University in Worchester, Massachusetts. She suffered a heart attack in 1929 from which she would never fully recover. Working from her hospital bed, and later from her home near the university campus, Semple was able to publish her third and final book,Geography of the Mediterranean Region: Its Relation to Ancient History, in 1931. The book surveyed the history of the ancient Mediterranean landscape, focusing on how the Mediterranean sea, its mountains, and the deserts around them established Western civilization. In late 1931 Semple moved to Florida, at the recommendation of her doctors. She died in West Palm Beach on May 8, 1932 and was buried at the Cave Hill Cemetery in Louisville. At the time of her death, Semple was widely considered to be the dean of American geographers and the world’s leading anthropogeographer. Although she did not consider herself to be a feminist geographer (as Harvey Flad remarked, “she was a feminist, and she was a geographer, but she was not a “feminist geographer,”), there is no question of Ellen Semple's impact— as a woman of many firsts— on feminist history. She was the first president and afounding member of the Association of American Geographers. She was the first female geographer to give a lecture in front of the Royal Geographical Society. In her time, and for many years after, Semple was regarded as a very important woman throughout the world for the students and scholars of the natural sciences, geography, and feminism. Interview with Professor Emeritus of Geography Harvey Flad, Vassar College. Semple, Ellen Churchill, Influences of Geographic Environment, 1903. Whitbeck, R.H., Ellen Churchill Semple Obituary, Geographical Review, Vol. 22, No. 3. (Jul., 1932).